When one pursues a goal that has never before been attained, reasoning by analogy and learning through vicarious experience can be particularly helpful, since one is unlikely to find a comprehensive, step-by-step guide for how to overcome a challenge that has not yet been overcome. In the absence of such a guide, beneficial insights can be gained from, first, reflecting upon actual, historical events and experiences surrounding a prior challenge that is meaningfully analogous to the present challenge, and, second, participating—at least in one’s imagination—in scenarios in which a challenge is overcome, be that scenario based in fact or fantasy. In seeking to abolish the property status of other animals, animal rights activists are currently in pursuit of such a hitherto unattained goal: no human culture, at least to the author’s knowledge, has ever achieved animal emancipation and personhood. In short, modern abolitionists can rely upon no roadmap drawn by “someone who’s been there.” But analogy and vicarious experience can help serve at least some of the functions of a roadmap. While the author of the present article has considered, in other articles, some lessons that might be drawn from historical precedents, the present article begins to explore fantasy and mythology, not history, and the types of teachings one might take from fictional worlds and tales. J. R. R. Tolkein, author of The Hobbit and The Lord of the Rings trilogy, was familiar with traditional heroic literature. Indeed, he performed a full translation from Old English to Modern English of the medieval epic Beowulf and lectured with authority on this subject. In creating the incredibly rich fantasy universe in which The Hobbit and The Lord of the Rings are set, Tolkien included characters cut from traditional heroic cloth, such as Aragorn, a king who returns from obscurity to claim a throne, and Boromir, a mighty but dangerously ambitious warrior. Tolkien also employed, at least partly, a plot motif common in traditional heroic literature: the quest. Yet, despite having such tools and techniques readily available, Tolkien chose a very different sort of character to play the central role and serve the essential function of a hero: to defeat the enemy, Sauron, and to destroy the base of the enemy’s power, a magic ring. This different sort of character—the “hero” of Tolkien’s epic—is Frodo Baggins. Unlike Beowulf, Aragorn, or Boromir, Frodo is not born into a position of high rank. Nor is he a formidable warrior; indeed, his “hobbit” race are quite small in physical stature when compared to average-sized humans, let alone humans of heroic proportions. Moreover, the temperament of hobbits—at least of Frodo’s immediate circle of hobbit friends—differs substantially from that of a traditional heroic culture. Frodo’s hobbits are more merry than grim, more trusting than cunning, more open than vain, more dainty than bellicose, more merciful than vindictive. But, while these distinctions between Frodo and traditional heroes are significant, Tolkien’s hero threatens the tradition in an even more fundamental way. While Frodo lacks certain traits with which heroic characters are traditionally associated, he also has at least one trait that characters in the heroic tradition, as embodied in Boromir and, perhaps, Aragorn, seem to lack: a profound capacity to resist the temptation of power, even when that power is very great and even when that power lies literally and metaphorically in the palm of one’s hand. This very capacity to refuse, renounce, or refrain from power over others is what enables Frodo to carry the burden of the ring—of the quest itself—when the traditionally heroic characters cannot. Frodo’s unique ability—without which the quest would have failed—to forgo power over others strongly resembles a central tenet of an ethical vegan’s personal character. Unlike non-vegans, an ethical vegan chooses not to kill, even when she could do so effortlessly and even when she could potentially benefit in some way from doing so. An ethical vegan chooses not to exploit or subjugate, even when her material wants and needs might be better served by doing so and even when she faces no realistic resistance or retaliation from potential victims. These instances of willingness and will set an ethical vegan apart from the rapacious habits of humanity as surely as Frodo’s character departs from the dictates of traditional heroism and heroic literature. In this distinction lies a different form of potency, not the violent force of a blade, but rather a capacity to replace an old paradigm with a new and brighter paradigm. In The Lord of the Rings trilogy, such a shift appears, to a degree, both in the story itself and in the story’s relationship to the genre of heroic epic. In the story, success of Frodo’s quest dramatically ushers in a new epoch for the people in Tolkien’s tale; the geopolitical, social, psychological, and demographic landscapes of post-Sauron Middle Earth fundamentally differ from those of the Sauron days. In the story’s relationship to the genre, a subtler but, for present purposes, more significant shift occurs in which an old standard for heroism, one based on strength, pride, combat, and conquest, is supplanted by a new standard, one based on self-restraint, humility, and perseverance in what is right—even to the exclusion of what is self-serving. The real-life paradigm shift toward which ethical vegan activists strive has no direct historical antecedent. We cannot from personal experiences or history books fully learn what life will be like in a post-abolition world. But achieving this unprecedented transformation will depend in part on the special potency that Frodo exhibits, namely, that of declining the invitation to grasp, to overreach, to take what is not one’s own. This special potency is shared by—and a defining trait of—ethical vegans. Meanwhile, the contrast between a pre- and a post-abolition world will be every bit as dramatic, decisive, fundamental, and bright as the triumph over Sauron to which Tolkien’s makes us privy. Vicariously experiencing this triumph and the dawn of a new era for the people in Tolkien’s epic may serve to inspire, encourage, and rejuvenate activists during moments when real-life efforts seem ineffectual and obstacles seem insurmountable. 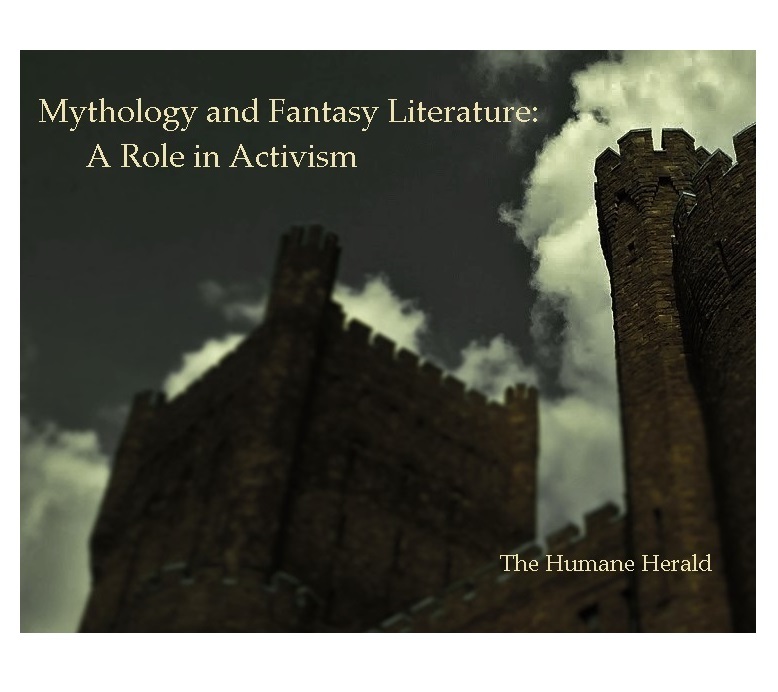 This discussion has attempted to provide an example of the potential value of fantasy, mythology, and imagination when real-world history and experience are silent. Other examples will be explored in future articles. Shel Harrison teaches law, logic, writing, and reading comprehension.